Lower back pain is one of the most common musculoskeletal complaints experienced by ladies during pregnancy. Most commonly the pain is experienced at the base of the back but may refer into the buttocks or legs. The main reason for the development of back pain during pregnancy is the changing position of the pelvis as the baby develops in the womb. As the baby grows the pelvis rotates anteriorly, increasing the natural arch at the base of the mothers back. Certain movements and positions will increase pain caused by the changing pelvic orientation. Sitting for example tends to make the pain worse. In particular rising to stand from a sitting position having been sat for a period. Sitting with ones legs elevated also tends to worsen the symptoms experienced by the expectant mother. What should expectant mothers do to prevent this problem? Much of the same advice for general back pain applies during pregnancy too. Trying to be more active, swimming, walking, yoga or pregnancy Pilates should all help. Reducing the time sat down, both at work and at home. Trying to take time away from the desk should all go some way to alleviate your symptoms. There are particular exercises that should be preform by ladies with these problems during pregnancy. 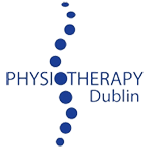 In order to compensate for the exaggerated anterior pelvic tilt and increased lumbar curve, sufferers often get great symptomatic relief from exercises designed to work on tilting the pelvis posteriorly and some gentle core exercises. The posterior pelvic tilt forms the basis for much of these exercises. 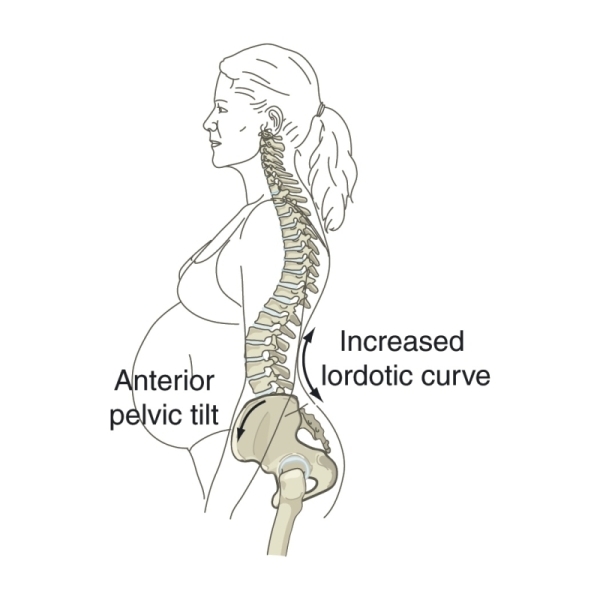 It’s demonstrated here and performed in isolation can go some way to remedying back pain caused by this particular postural change during pregnancy. 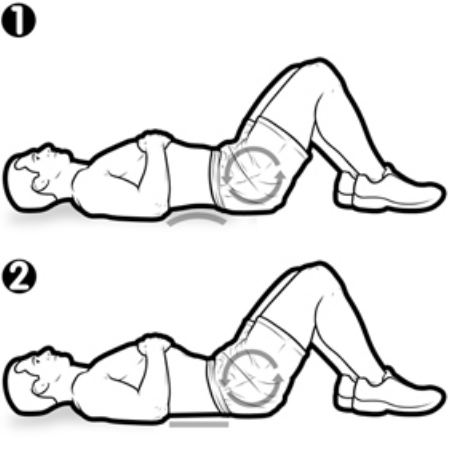 Lie on your back with your knees bent, feet on the floor and your pelvis and lumbar spine in ‘neutral’ (1). Tilt your pelvis backwards by flattening your spine and sliding your tailbone towards your feet (2). Hold this contraction while breathing normally for 3 breaths then slowly return to ‘neutral’ (1). Relax and repeat.